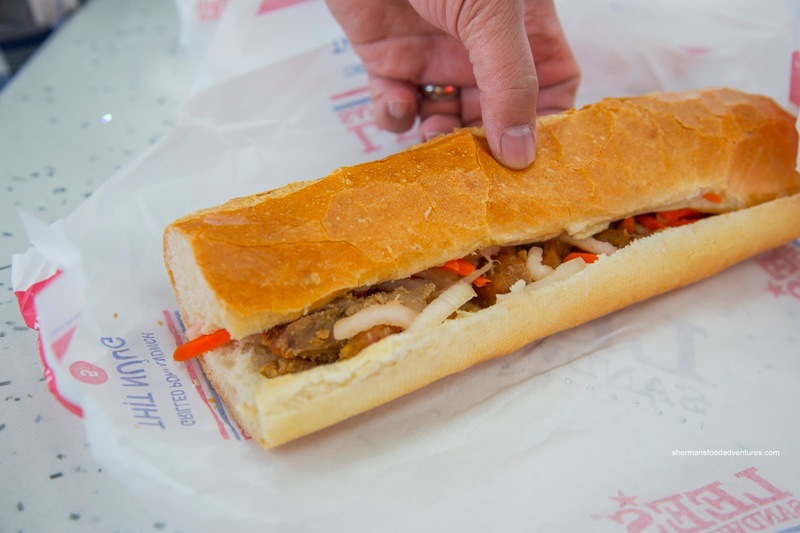 After a unsatisfying amount of food at Pho Lu, we were still aching for more eats. I guess all those large portion sizes from all the other restaurants expanded our tummies. Or at the very least, we were suffering from "eyes bigger than our stomachs" phenomenon. 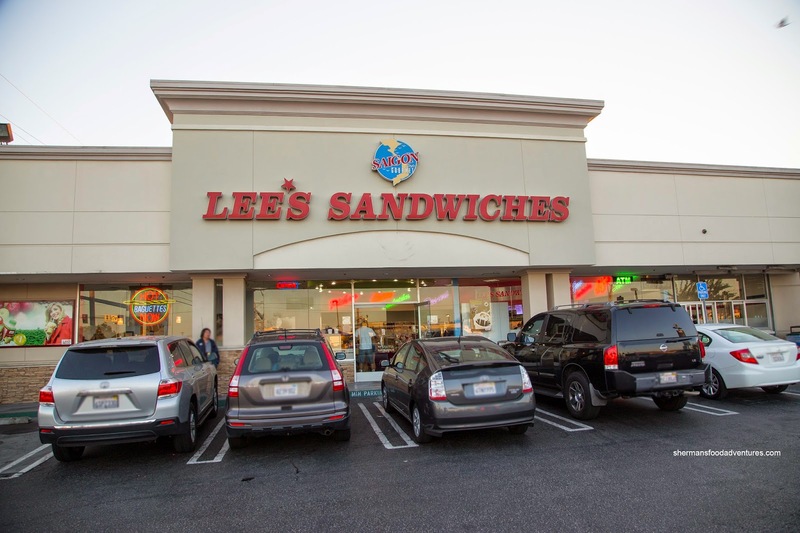 Whatever the case, we made the short drive down Westminster to Lee's Sandwiches. 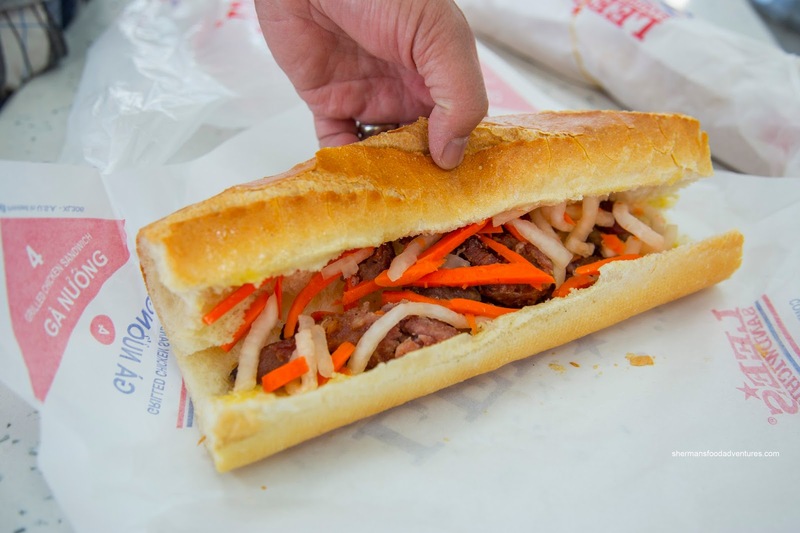 Costanza had heard about the popular Vietnamese Banh Mi joint from some friends and really wanted to check it out. So we did. 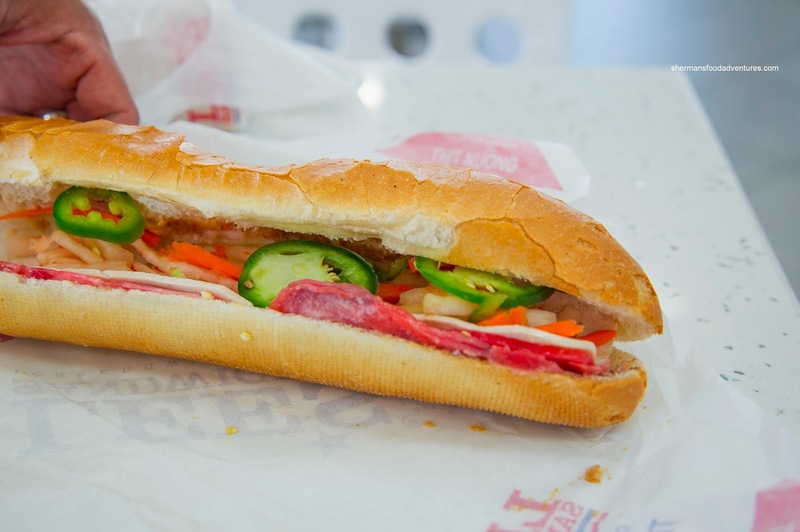 I tried the Combination Sub (commonly referred at the Banh Mi Dac Biet) and it felt like something was missing (well, other than the cilantro that we omitted). One look and yes, the light streak of pate meant it was essentially a non-event. Hence, we could only get the faint meat flavor from the modest amount of meat. Furthermore, the bread was a bit too firm for my liking. I got the Chicken Sub for my daughter as she was whining about being hungry as well (thus, no peppers or cilantro. It was okay with plenty of sweet chicken chunks. It wasn't dry per se, but not overly moist either. Of course since it was missing 2 components, it was more mild that it should've been. Lastly, I got the BBQ Pork for my son (yes, he was hungry too!). It was also not completely moist, but it was flavorful though with a sweet caramelization. The pickled daikon and carrots were sufficiently tart and sweet with a good crunch. And again, we omitted the peppers and cilantro, so naturally, it would've tasted different without them. Despite what was omitted or not, the bottom line was that we were not impressed with the sandwiches. We found the bread too dense and not crusty enough while the meager amount of ingredients affected the overall impact. Bottom line - we've had much better elsewhere.